So I am all for eating "real" food straight from the earth, but sometimes a person has to have something on the run and doesn't have time to grill a chicken breast. Sooo...I am always looking for high protein bars that are as clean as possible. I have relied on Quest Bars for a while and they are fine, but are a bit pricey ($2.39-$3 a pop). Then, someone told me that Costco has a look-alike bar. And they weren't lying!! 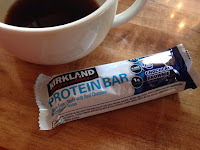 The Kirklan brand Protein Bars are gluten free and have the same ingredients as Quest but without the nasty sorbitol that can mess with people's (i.e. my) stomach. AND they are like $1 a piece...WHOA, right?! 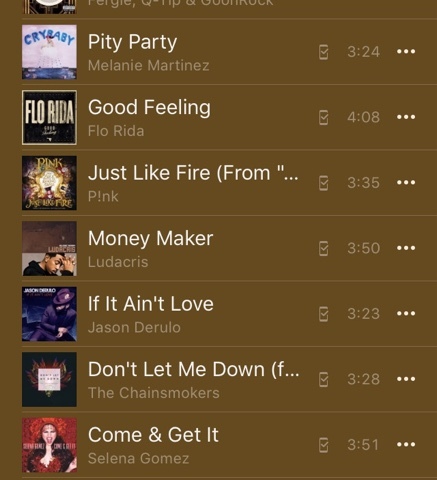 Now I don't have to hide them from my kids and babysitters...hehe. Anyway, they have two flavors: Chocolate Brownie and Chocolate Chip Cookie Dough. I will miss the vast number of flavors Quest offers, but you really can't beat this price and holy moly, these bars are sooooo yummy. Here are the down and dirty nutrition facts: 190 calories, 7 grams fat, 23 gram carbs, 15 grams fiber, 1 sugar and a whopping 21 grams of protein. So I used to get this veggie mix all the time from Trader Joe's....and then I forgot about it...weird. Anyway, summer craziness is full blown in my house and I barely have time to chew my food before swallowing it, let alone spend a ton of time dicing a nice variety of veggies. 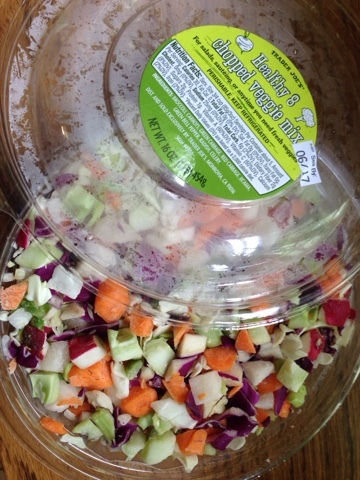 Re-enter the amazing Healthy 8 Chopped Veggie Mix into my life. It is chalk full of fiber and vitamins and includes broccoli, carrots, green cabbage, red cabbage, jicama, green bell pepper, radish and celery....boom. I use it for like a zillion things: under eggs on a veggie pile, as a hearty salad topper, sauteed on the side of grilled chicken or salmon, in soup or even as a crunchy, low-calorie snack. You can get your own at Trader Joe's in the refrigerated vegetable section. So once again I'm stuck going from place to place without any break to eat dinner. What's a girl to do today? Chicken, anyone? 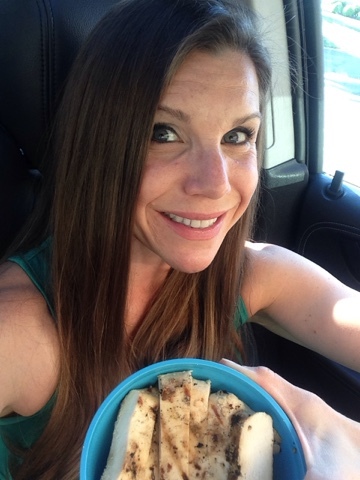 I made sure my amazing husband grilled a few more chicken breasts this weekend and cut them into chicken "fingers" for the perfect protein dinner on the run. I just finished teaching a very sweaty spinning class for a friend and have 20 minutes to get to my next shin dig. So what's a girl to do for dinner? 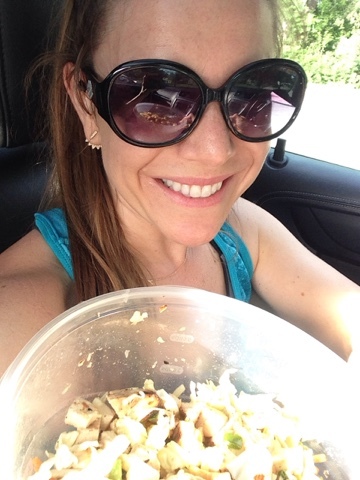 Well, this girl anticipated her hunger and packed a salad to eat between the gym and the next deal. I totally get that a drive thru is totally easy and convenient but for the most part, it's not awesome for health goals. Sooo if I can plan, I do. Hence, Car Salad. I took a bunch of pre-chopped veggies and greens, added leftover grilled chicken form a BBQ this past weekend, threw some olive oil and vinegar on it, popped it in my son's insulated lunchbox and viola! I'll save the drive thrus for emergencies. Today, I will down this clean and fresh car salad.